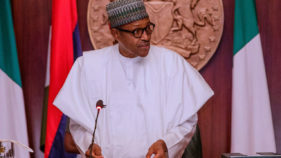 President Muhammadu Buhari, yesterday, while appealing to traditional rulers in Osun State to support his reelection to enable his administration consolidate on its achievements, revealed that APC was able to win the state’s governorship election held months back with the aid of remove control. The President said this while interacting with the monarchs led by the Ooni of Ife, Oba Adeyeye Enitan at the banquet hall of Osun State Government House. 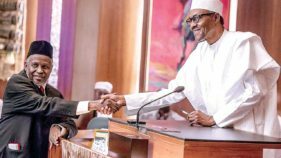 Buhari, received on arrival along with Vice President Yemi Osinbajo by Osun State Governor, Adegboyega Oyetola and his entourage, said the APC has recorded gains in the areas of infrastructural hence the need for the people to return the administration to consolidate on the achievement its has made in the last three years. 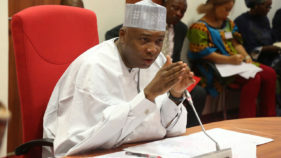 He urged the traditional rulers to join hands with his government to tackle the menace of insecurity, assuring that his government was working towards providing social service programmes and soft loans to farmers to boost the agriculture sector of the economy. Oba Wahab Kayode Oyedotun, speaking on behalf of the Ooni of Ife, Oba Adeyeye Enitan Ogunwusi who arrived later, assured President Buhari of victory at the February 16 Presidential election.